After AS told me he loves me (Our unconventional love story), everything went in fast pace. 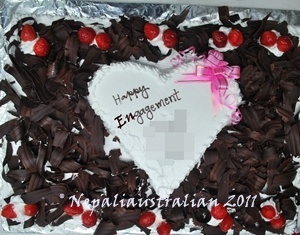 We continued to Skype and phone and by the time he was going to be in Nepal, we both were sure this is what we wanted. Even it wasn’t long, it felt like we been together for life time. I think as we were friends for so long, it helps us to bridge the distance we had. The next step for both of us was to tell our parents as we want them to stop looking for match for us. We were planning to do that around the same time so we know straight away how things are going to work out or not. Both of us are from same culture, same ethnic background and same cast so it seems done deal. But until we really make that step we were worried. We didn’t have any other plan if our parents said NO for any reason. With the grace of God, both our family took the news very well and they wanted to meet each other officially. They were happy that we made a good couple. So the date was fixed for meeting where they were going to officially ask my hand for marriage called “Kochi” ( Newari word for fix).This is a tradition in Newari / Nepali wedding. That was one of the scary days for us as things were happening too fast. We know it was going great but still scared if something will come into picture and ruin everything. But after our family meeting in one of the restaurant in Kathmandu, everything went well. As both of us were leaving Nepal again, both the family though it is wise to have engagement ceremony to announce that we are engaged to be married soon. For AS and me it was great relief that things were going as we wanted. Both families agreed that ceremony should be small and for only close family and friends. But I forgot in Nepal, small is not really small and it turned out to be ceremony for almost 150 people. Initially, we were planning to have the ceremony at my house, but with 150 people, it was not possible so a date and venue was arranged. I was dressed in red sari with golden work. Had my hair and make up done Nepali bridal way. AS was dressed in dark blue suit and I swear he looked so handsome. My mother in law, following traditional way, has brought trays of sweets, fruits and gifts for me. The ceremony started with welcoming everyone to this big new family. It followed by elder putting Tika (a mixture of rice, yogurt and vermillion) on our forehead. At the end , we had so much Tika on our forehead; it kept sliding to our nose. Then in front of our families and friends, we exchanged rings and we were officially “ENGAGED”. After that we cut cake, had photo time with everyone. It was followed by snacks and main meal. And of course there was much-loved dancing. It was really a great days for both of us. We never expect it to be so easy and quick but we didn’t mind. 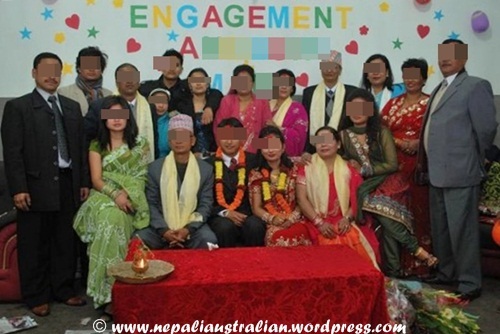 This entry was posted in Wedding and tagged Engagement, Kochi, Nepalese wedding, nepali australian, nepali wedding, newari wedding, tika. Bookmark the permalink. Well done with the affairs of the engagement – seems like it was *very* traditional. The sharing of the rings, in particular, is something I am a little peculiar about. 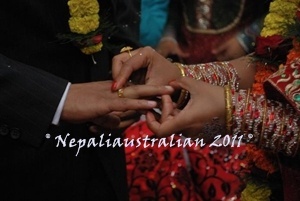 Newari traditions require that the rings be exchanged during the engagement ceremony – right? And of course, your husband most probably (I’m guessing here) did not propose to you with a separate ring beforehand. For romance’s sake what do you think if a guy would like to *really* surprise the hell out of the girl – as they do in most western countries – with a ring proposal on some picturesque location and then made it official at that point (and of course, the guy does not get a ring). We spread the good news and during the engagement party we continue with the celebrations without the ring exchange (I personally think that an engagement ring would look a bit tacky on a guy). Would this work? Also, what is the official stone / gem for newari engagements? I know she probably won’t say no to a 1 or 2 ct diamond solitaire but maybe there is a way to mix and match the tradition with a modernish flair – maybe diamond in the middle and the traditional gem / stone around it AND of course, something impersonal (which I can’t think of right now). Getting a dime a dozen diamond rings for a girl is just SO boring. Any other suggestions would be good. Sorry about the mouthful. Thank you. 🙂 Ya it is churaa or chura. I love your churaa (is that how it’s spelled?) It’s so pretty!